White Pudding is a traditional Scottish oatmeal dish though it is also cooked in Ireland. It is usually eaten with mince and tatties, battered and deep fried at a chip shop and served with chips as a white pudding supper and sometimes used as a stuffing for chicken, though usually an alternative white pudding recipe of skirlie is used. Some Scots like to eat slices fried along with their cooked breakfast, though this practice is more common amongst the Irish. The best answer to the question what is a white pudding is really tasty! It is made into tripe skins and ingredients for white pudding usually contain toasted oatmeal, onions, beef suet, spices and seasoning. Some butchers also use pork meat. Generally it is sausage shaped though the larger haggis shaped ones are also common in Scotland though generally called mealie pudding. Very old traditional Scottish recipes for white pudding also used to contain sheep brain matter which was used as a binding agent rather than for its flavour. 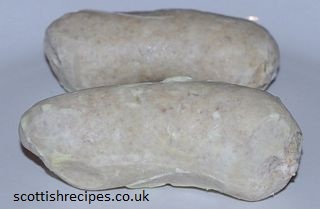 Vegetarian white pudding is also available from some butchers and shops in Scotland. Other names for it include mealie pudding, mealy pudding or oatmeal pudding. In England it is known as Hog's pudding, especially in Cornwall and Devon. For a traditional Scottish white pudding recipe we recommend Maw Broon's Cookbook which has a list of white pudding ingredients and step by step instructions to make and how to cook a white pudding. An older and more traditional way of making white or mealie pudding can be found in the book The Scots Kitchen by F. Marian McNeill. The main ingredients for this white pudding recipe are oatmeal, suet, salt, Jamaica pepper, onions and tripe skins. She suggests that they can be stored for months if hung up and kept dry. They can then be cooked in hot water and then browned in the frying pan. 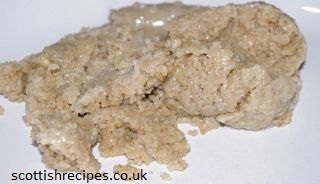 There is also a mealie candy using the ingredients sugar, treacle, oatmeal, ginger and water. More white pudding recipes and where to buy white pudding to follow soon. 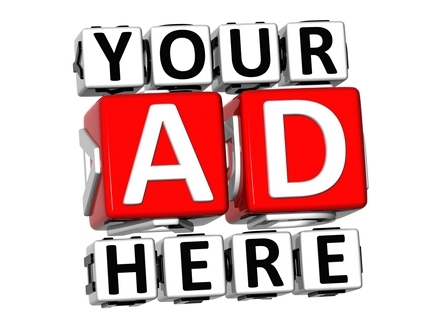 A competition was started in October 2011 by The Lodge restaurant at Strichen Country Park in Aberdeenshire. Butchers across Scotland submitted their white puddings to the championship contest which was staged by the Scottish Federation of Meat Traders Association and sponsored by Grampian Oats Products. As you can see from the photos of white pudding it is not the most attractive of food, but Scottish white pudding is very tasty, especially when served with Mince and Tatties. The Sunday Post reported an unusual wedding in Scotland in their newspaper on the 6 November 2011. Ben and Eryn Martyn-Godfrey from London married in Dumfries and loved visiting Scottish fish and chip shops so much that they held their wedding reception at Rob�s Fish and Chip Shop where they also had their first dance! The bride had a white pudding supper and a deep fried mars bar as a sweet all whilst the full party wore their wedding outfits and Eryn her wedding dress. They continued their fun wedding celebrations in the first class carriage on the train back to London. The book Scots Cooking: The Best Traditional and Contemporary Scottish Recipes by Sue Lawrence has another traditional white pudding sausage recipe using pudding skins from a butcher, medium oatmeal, finely chopped onions, shredded beef suet and Jamaica pepper.